This place was the alternate choice to Miracle Hot Springs, but since that one is now closed – this is the main attraction out along the lower stretch of the Kern River. National Forest Hobo Campground is a few miles away and there is also plenty primitive style camping options if you so choose. Remington is by far, one of the nicest primitive hot tubs in the whole region and easy to access. If you can find it, the rewards are great!! Can be crowded on weekends. If the dirt parking lot is totally full, come back later or wait it out. 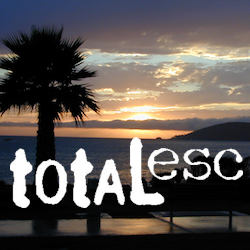 You can find travelers, mountain bikers, dirt bikers, hikers, backpackers, campers, off-roaders, RVers, burners, desert rats, military boys, local kids, LA couples, techno DJs from Russia – a wide variety of people soaking at this not-so-secret spot. These unique hand-crafted stone tubs are located on the Lower Kern, overlooking the big river and the fish. 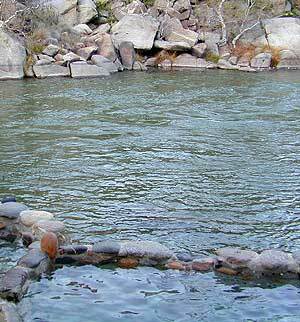 3 volunteer built cement & river rock hot spring pools sit adjacent to the Kern River. There is also another small cooler tub on the trail perched above the thick brush. This prime recreation spot is located a few miles west of Hobo Campground (old Miracle Hot Springs) is sometimes busy: dirt parking lot, minimal sign & the tubs are not viewable from the road. From parking area you must hike down a steep grassy trail for about a mile. Bring towels, beverages & everything you will need from the vehicle, as turning around to go back & get everything half way down will prove to be a challenging trail up. Boulders & oaks on steep hillsides. A few campsites down along main trail. Wildflowers here are wonderful in Spring (April-May). Please pick up litter & keep this place beautiful. 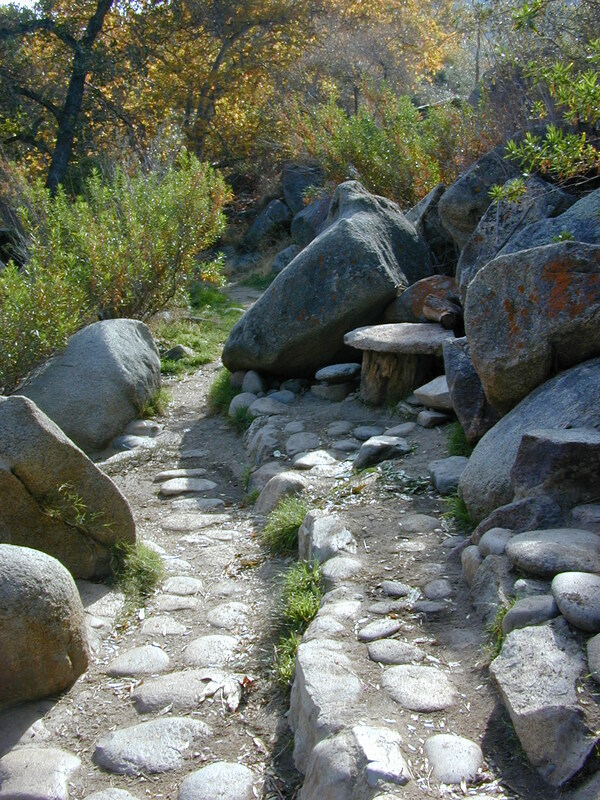 Remington primitive hot springs are located inside the lower Kern Canyon, southwestern part of Sequoia National Forest. Take Highway 178 east to the 4 lane portion, look for Borel Road right turn which climbs a steep hill up to Old Kern Canyon Road. At this stop sign you will see a sign for Remington Trail (3.5 miles) pointing to the right. Remington Trailhead (signed) & dirt parking lot across from trail, is located on Old Kern Canyon Rd, which runs parallel to the 4-laner Hwy. 178 on the opposite side of the Kern River. The well known Kern Canyon Road is also labeled as “Cort 214” on GoogleMaps. Ardell’s Tip: Remington is one of the few spots in California that you can fish a major river from a hot tub. Minimal camping spots & very little privacy at the main parking lot at Remington Hot Springs. The best tent camping is located down on the trails, so you may choose to hike-in to the secluded oak and beach camps below. No facilities at Remington, no tables, no toilets, so come very prepared to “rough it”. 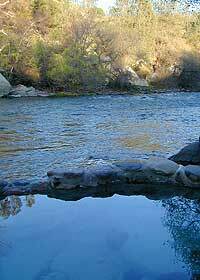 Sandy Flat Campground and Hobo Campground are a few miles to the east, on the same Kern Cyn Road; Breckenridge Campground is on a tall pine ridge just to the south, but requires a long drive around the mountains, or a rugged vehicle for a steep dirt road. Folks seeking more seclusion can choose to primitive camp along the narrow paved road leading to the west. Motorhome campers like the option of road side boondocking with great views; several level pullouts can accommodate most any camper. 4×4 camping is closer to Lake Isabella @ Keyesville or BLM River Camping. Primitive camp spots on numerous dirt roads are located in this Lower Kern River area, but you will need to check with Sequoia National Forest ranger for gate closures, fire permit & fire current restrictions.